Set a rectangular piece of felt on a table horizontally. Make small slits along either side to represent a placemat. 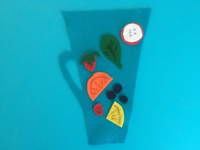 Cut two circles out of colourful felt, a small one to represent a drinking glass and a larger one to represent a plate. 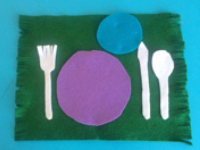 Cut simple utensil shapes out of gray felt. Use this simple game to teach children how to set the table. If you wish, provide an example and encourage them to reproduce it. Cut several tiny diamonds, triangles, circles, and squares out of various colors of felt. Cut several silhouettes (head and neck only) out of black felt. Display these silhouettes on your felt board. Invite children to pretend they are jewellery designers. 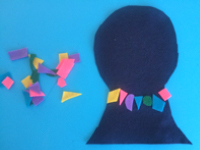 They can arrange the colourful shapes in a line on the silhouettes to represent necklaces. Display a large white birthday cake shape on your felt board. Cut several tiny geometric shapes (rectangles, triangles, circles, stars, etc.) out of colourful felt to represent candy pieces. You will need two small square cardboard boxes. Wrap one box in white felt. Draw one of the shapes you cut out on each side of the box. Stick a different color of felt (one of the colors used for the shapes) on each side of the second box. Children take turns rolling the dice. If, for example, a child rolls the dice and they land on "red" and "circle", he/she will have to find a red circle to add to your cake. Keep going until your cake is completely decorated. Glue a sheet of felt on a piece of cardboard. Use a permanent marker to draw a tic-tac-toe grid. Select two other colors of felt. Cut X's out of one color and O's out of the other color. If you prefer, pick two fun shapes instead of using X's and O's. Show children how to play tic-tac-toe. This game can easily be carried outdoors or from one room to another. It's perfect for keeping older children busy as they wait for little ones to wake up at the end of naptime. 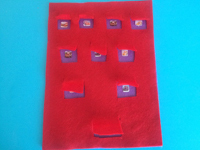 Glue a "+" sign and an "=" sign on a piece of felt. 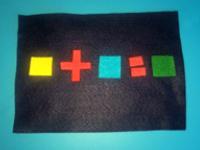 Cut squares out of several different colors of felt. They will be used to complete equations that will represent color combinations. For example, you can stick a red square to the left of the "+" sign and a blue square to the right of the "+" sign. Help children discover that mixing these two colors produces purple. You may use paint to test this color equation and then have children add a purple square after the "=" sign. You can provide several examples and invite children to reproduce them. Cut large dinosaur silhouettes out of green or brown felt and stick them on your felt board or large pieces of cardboard. Cut stripes, polka dots, and zigzags out of colourful felt. Children will enjoy using their imagination to "decorate" the dinosaurs. Trace the contour of each child's feet on felt. Cut out the shapes so they are a little bit wider and longer than children's shoes/slippers. Use hot glue to stick a piece of ribbon on either side of each felt foot. Use the ribbon pieces to tie the "skates" on top of each child's feet (with the felt on the soles of their feet). Children will love "skating" around your daycare to the sound of music. Cut a shape that looks like a blender jar out of light blue felt. If you wish, you can also cut what looks like the base of a blender out of black felt to make this game seem real. Cut several fruit shapes out of colourful felt. Invite children to fill the blender jar with the fruit they prefer (or the fruit you name for a recognition activity) to create unique smoothies. Glue several pieces of green felt on a piece of wood and set it on the floor. Use chalk or a permanent marker to draw streets and roads on the felt. Cut houses, stores, a school, trees, and playground equipment out of colourful felt. Let children stick the buildings and items here and there on your board to create a city. They can transform the city as often as they wish and play on the board with figurines and toy cars. For each child, cut a purse or backpack shape out of felt. Glue each shape on a piece of cardboard. Cut several simple items that can normally be found in a purse or backpack out of colourful felt: lipstick, coins, keys, telephone, comb, etc. You must have one of each item for each child. Give clues to help children identify the various items they must add to their purse/backpack. For example, you could say, "You need this to open the door when you get home (keys)." Children must identify the keys and add them to their bag.